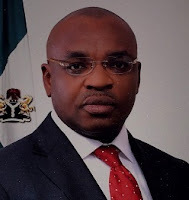 THE appointment of people into key political positions in Akwa Ibom State is currently generating another round of controversy for the new administration of Mr. Udom Emmanuel. And if not nipped in the bud, the matter is likely to constitute a major challenge for the administration that is currently faced with difficult questions regarding the conduct of the governorship election in the state. It started with the appointment of the Secretary to the State Government, SSG, Mr. Etekamba Umoren, who was Chief of Staff to immediate past governor, Godswill Akpabio and other key aides including Mr. Aniekpeno Mkpanang past Permanent Secretary of Protocol and now Permanent Secretary, Special Services Department. Also among those who emerged as key office holders are; Messrs. Aniekan Uko and Effiong Bassey, who were elected Speaker and Deputy Speaker of the state House of Assembly. Fingers have been pointed at Akpabio as being responsible for the emergence of some of these political office holders. In fact some even allege that Akpabio compelled the state lawmakers to ensure that his preferred candidate emerged as speaker. But that has been dismissed by Ime Okon of Ibiono Ibom State constituency, who described the allegation as laughable saying the House is truly independent. His words, “Senator Godswill Akpabio cannot nominate anybody for leadership position in the House, he does not have the right likewise Governor Udom Emmanuel. They may have their preferences as individuals but that s not to say he is the one nominating. Another source of trouble is the recent nomination of 20 names that would form the new executive council. Surprisingly, 11 persons who served Akpabio as commissioners and three immediate past state lawmakers, made the list. The fact that these men, had served in the last administration, further increased the mixed feelings over the calibre of Udom’s would be appointees. The ex-cabinet members, who made the list included Mr. Aniekan Umanah , Dr. Glory Edet, Emmanuel Enoidem, Mr. Uwemedimo Nwoko, Mr. Monday Uko, Prince Godwin Ntukude, Akan Okon and Enobong Uwah. Others were Mr. Uwem Ita Etuk , Chief Emmanuel Ibiok , Mr. Etido Inyang, Mr. Aniekan Akpan from Ukanafun, Ekong Sampson and Anietie Etuk. The development has attracted more criticisms from the governor’s Eket zone. Their grouse, it was gathered was borne out of the fact that recycling Akpabio’s men could deny other parts of the state the opportunity of being represented in the administration. They are also angry that Udom neglected competent sons and daughters of the state, who had supported his ambition when it mattered most. However Chief Nduesse Essien a former Minister of Lands, Housing and Urban Development and respected PDP chieftain from Eket local government area pleaded with critics and indeed the entire Akwa Ibom people to be patient with the governor adding that he (Emmanuel) needs some time to dictate the pace of his administration and not criticism and distractions. “What I can say straight is that the governor knows where he is going that is why he has decided to appoint the people he can work with him for now. He is trying to create a smooth transition from the previous administration into the present administration. Our people should therefore be patient and allow him to dictate the pace of his administration. In the long run it will pay off in the interest of the entire state. “And commissionership should not be treated as a benefit, but appointment of somebody who is competent enough to add value to governance. We should also realize that the governor is not a magician that will employ everybody within two weeks of his administration. He cannot also satisfy every village, every local government and every community within these two weeks. There are so many positions that will be filled later so let us allow him to build on the foundation of his administration,” Essien asserted.